I always believed that I had high academic and behaviour expectations of my pupils whilst working at my placement school in South Manchester. I was known to be strict at times because of my high expectations. I would give sanctions out to pupils who would not be giving me their 100% attention. I would insist my pupils SLANT whilst I was teaching to avoid fiddling. I would teach from the board and go through worked examples. My pupils knew how I wanted them to behave in my classroom. My pupils knew how I would behave if they were compliant or defiant. However, when I arrived at Michaela, my expectations were seen as low, and they were, and here I explain why. Olivia Dyer, Head of Science and Founding member of staff, said to whilst giving me feedback that “we act the anger, and feel the warmth.” Being angry and negative is emotionally draining for a teacher so we act when we over exaggerate and over justify why talking in the corridors is unacceptable. Furthermore, we are wholeheartedly loving when a child is successful and we celebrate it to make that child feel valued, and to have surrounding pupils identify the kind of behaviour they need to demonstrate to be identified as an exemplary Michaela pupil. This gives pupils clarity on how to behave and how not to behave. We do not give leeway to different extents of behaviour. If a pupil is doing something that they are not supposed to do then we would pick them up on it, no matter how subtle. At my previous school, I would give demerits because pupils would not be tracking me whilst I was teaching. If a pupil was rude even in the most subtle way such as smirking or curling their hands I would go ballistic. Surrounding teachers thought I was crazy for it. At Michaela, teachers have sky-high expectations of pupils and our behaviour management is consistent because we all use the same language for rewarding and sanctioning pupils. At my previous school, there was minimal consistency in rewarding and sanctioning pupils. We did not all have the same dialogue for sanctioning or rewarding students. If I ever pulled a child aside in the corridor for being too loud or demonstrating inappropriate and unprofessional behaviour then I would hear the response “Well [insert a member of SLT’s name here] did not say anything down the corridor when I was behaving this way.” It was exhausting. I would be the teacher who was crazy or too strict because of the high expectations I did have of the children. I would be unapologetic for giving a child a detention for not having a pen with them. I had one pupil who always forgot to bring in their exam prep folder, so for two weeks I proceeded to call the pupil’s house every morning at 7:15am to ensure that their daughter would bring their folder to school so they could be more prepared for my lesson. At Michaela, all teacher’s have unapologetic and uncompromising high expectations of each and every pupil. Even more so our expectations are even higher for the pupils with the most tragic circumstances. We cannot change a child’s tragic circumstances at home but we can control their learning circumstances at school. If anything, it is more important to have high expectations for pupils who have those tragic circumstances so they have all the potential to escape their situation using education as the engine for such mobility. I know that the sanction I give to a student for a particular issue in science would also be sanctioned three floors downstairs in MFL by another member of staff. We are incredibly consistent. And students know that too…isn’t that the dream in any school? Students do not push their limits with us. For example, we expect all pupils to bring a pen to school, and if they do not have one then we provide them with the opportunity to rectify the issue in a way which does not impact others around them. We have a stationary shop open between 7:30 – 7:50 am just before schools starts. The onus is on the children to meet our high expectations and we are explicit with what our expectations are. We are all consistent with the dialogue we have around school when we interact with children which contributes to a consistent and strong school ethos. As teachers we have bought into what is considered as Michaela standards. We have children bought into Michaela standards too. There are many reasons behind the success of Michaela Community School and one of them is the uncompromising high expectations that all teachers have of each and every pupil our school serves. Children respect our standards because they understand that we want the best for them. Furthermore, to be the best pupil then pupils need to meet those high standards. My standards were considered high at my placement school where teachers were inconsistent with the dialogue they used and the reasons for sanctioning pupils or rewarding pupils. At Michaela, I realised my standards were not high enough. I had to raise my expectations, and I still am, but now I could not imagine reducing them. I would be failing myself as a teacher and the pupils that I teach. High expectations are underprioritised at majority of schools where at Michaela Community School it is part of the golden triangle of success. We know that what we are doing having our sky-high expectations is right when a pupil who I have given detention to, which I have accidently forgotten to log, goes to detention and informs Mr Miernik that he has detention and that he is here to serve it even though Mr Miernik has informed him that he hasn’t got one. Or when I get an appreciation during Family lunch “I would like to thank Ms Rizvi for coming into school today and teaching us even though she isn’t feeling 100%” or when I get a postcard from a pupil expressing their gratitude. Our Michaela high expectations in sanctioning and rewarding pupils comes from a place where we want our pupils to be the best possible student and human being. If you want to see us Michaela teachers and pupils in action then do come and visit us during a school day. Our doors are open to all. Come and have lunch with us. Today, I had a random flashback to a formal observation I had at my placement school. I remember having a discussion with the observer, a maths teacher, where we were debating over one particular point. I was teaching my second lesson on simplifying surds: from √a to the form k√b where k is an integer. Given that this was the first time my 9X2 set were learning surds, I went for a very explicit selection of worked examples, structuring one type of method to simplify a surd to k√b form. In my lesson I was structuring the teaching as below, where I wanted pupils to identify the highest common square number, which is also a factor of the ‘a’ in surd √a. In the lesson preceding this lesson, and in the weeks throughout the year, I would have pupils complete a recall activity frequently in which they had to identify the square number of the first 15 integers, and also square root the first 15 square numbers. The point was to ensure that pupils could recall these facts from memory, and develop automaticity in doing so, to the extent that there wasn’t an act of mental processing. I would ask pupils to select a factor which can divide 72 or 160 and which is also the biggest square number that can divide 72 or 60. They would then identify the square number and then write the root number of the square number below and continue on with the multiplication to simplify the surd to k√b form. This was done because it is the most efficient and accurate method to simplify surds. If children are taught one accurate method to simplify surds at the start then they will get the correct solution and feel successful. If children are taught one method to get the solution and then you explore the different routes to get the same solution afterwards then you are building on their existing understanding of how to simplify surds. The observer was suggesting that it would have been more beneficial for pupils to not have been taught one technique but to have explored instead a myriad of techniques. However, I think that what he was suggesting is only beneficial after they have first understood how to simplify surds in one accurate and efficient method. His suggested method could potentially cause several misconceptions insofar as you will have 30 pupils listing 6 possible attempts consisting of 12 different factors of 72. The lack of guidance and structure can lead to misinterpretations which leads to misconceptions. In the early stages of learning such an abstract concept it is best to provide one accurate, structured and efficient worked example for students to replicate with different problems and in order for them to consolidate their understanding of how to simplify surds. This is, effectively, pattern spotting. Only then you can start to explore the different routes to the same solution without risking many misconceptions developing, as opposed to the converse. Figure 2 + 3 – Comparing simplifying the square root of 72 using one algorithm, where we always select the highest common factor to be the highest square number that can divide 72, to the other multiplication sums when simplifying the square root of 72. As a maths teacher, and even when I was as pupil myself, I knew the most efficient way to simplify a surd such as √60 was to have a multiplication sum with a factor, which was also the highest square number, because this would result in an integer multiplied by a surd. I knew this because my teacher explicitly told me. Later on we explored different routes to get to the same solution. Since I knew the answer for simplifying √60 then when I got the same answer through different routes I felt successful and reassured. Why? Simply because I knew one concrete and accurate method to get the simplified solution for the problem. Teaching pupils one accurate method to solve a problem allows pupils to feel successful, and it further empowers them when exploring how to solve the same problem through different routes. At Michaela, we spend a significant amount of time discussing our worked examples; whether Dani, Bodil or I have made the section of the textbook which is being taught that half-term, we discuss what is the best strategy to solve problems where pupils are adding and subtracting algebraic fractions and where the denominators are integers. What is the best worked example to solve problems where pupils are to substitute a positive integer into an algebraic term or expression? We outline it very clearly in our textbook, and we organise three or more worked examples where we interleave fractions, GEMS, decimals etc., but the cognitive process which pupils go through is similar in all three worked examples. This is because we want pupils to look at a problem and be able to identify each step between the problem and solution. How do we do this? We explicitly state it: step 1, identify the lowest common denominator; step 2, form the equivalent fraction by multiplying the numerators by the common factor; step 3, add the fractions with like denominators etc. Figure 4 – Example of worked example made by Dani Quinn. Our pupils are taught explicitly and we demonstrate clearly using our visualisers one concrete, accurate and efficient algorithm for the problem in order to get the solution. The different routes to the same solution of the same problem are explored later on once we know that all kids in the room are proficient at solving a selection of well-sequenced and crafted problem types with the one method we taught them initially. Our pupils are mathematically proficient; they love to learn and they feel this way because they feel successful knowing one accurate method between the problem and solution as to how to add and subtract fractions with integers as the denominator, or variables as the denominator, or expressions as the denominator. They then feel empowered when they can get the same answer through different methods. And so, I respect that our opinions differed but I am sticking with the way I delivered the initial teaching of simplifying surds. 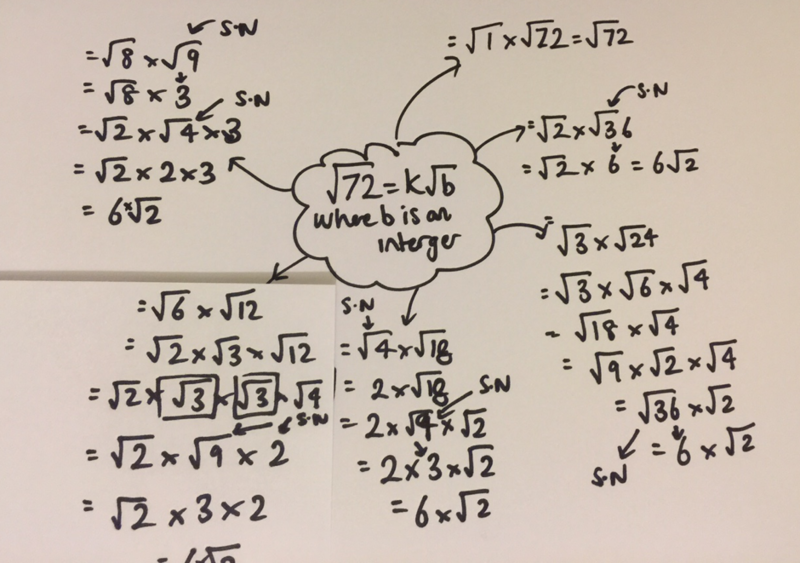 It was the second lesson of this topic and despite not 100% of pupils were getting the right answer on their mini-whiteboards – where they were at the fourth lesson.